How to Grow and Care for your own Coffee Bean Tree! You know how sometimes it seems to take forever, to get that first good cup of coffee in the morning? Patience always prevails, in time, and the coffee is ready! Mmmmmmmmm!!! Do you have the patience to wait FOUR years???? That is how long it will take you before you can harvest your first beans from your own coffee plant, (Coffea arabica). In the meantime, you can enjoy the dark shiny green leaves and fragrant white flowers of this very unique, ornamental plant. The coffee 'tree' is actually a variety of tropical evergreen shrub. Coffee trees do not begin to produce its full yield until its sixth year and will continue prime production for about ten years, however Coffee plants may live on for 60 years. The tree, if left alone will grow to a height of between 16 and 40 feet. In most coffee plantations the trees are kept at a manageable six feet to get the best yield and to make it easier to harvest. The best growing conditions are in a temperature range of 65 degrees Fahrenheit to 75 degrees Fahrenheit. Rainfall should be plentiful and the weather should switch between heavy rainfall and sunshine to bring the berries to full maturity. The type of soil is not too important but good drainage is a must! Coffea plants are fairly easy to grow in the home as a potted specimen, but they should be moved outdoors for the summer if possible. They grow best in filtered sunlight, with night temperatures in the lower to mid 60s and day temperatures of 70F or higher. Plant them in any good commercial, fast draining potting soil . The soil should be kept on the moist side, but never soggy. 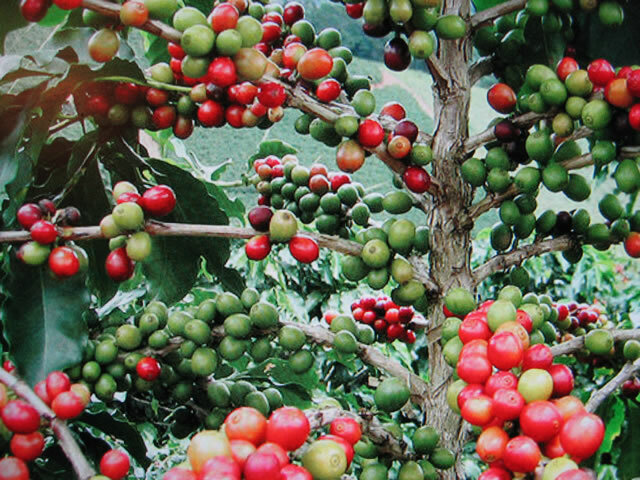 Coffee tree plants will produce fruit without any fertilizing whatsoever, but for best results and maximum yield, they should be fed every 2 weeks from March to October, and then monthly from November through February. Use a soluble, all purpose (10-10-10) fertilizer. Coffee trees will grow to about 10 feet if given ample root room, but can be pruned if this is too big for the allotted space. Pruning may involve simple pinching to produce a bushier plant, or you may go as far as cutting it way back.... Right down to where only two branches are left near the bottom of the trunk. The fruit are red when they ripen in the fall, with a sweet pulp surrounding the bean. 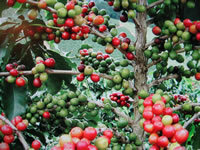 Each coffee berry produces two beans. The coffee tree's fruit does not all ripen at one time. In fact it will have blossoms and berries in various stages of ripening. Only the ripe berries can be picked. The berries cannot be picked when green since they will not ripen once picked. Once you have harvested sufficient beans to brew your first pot of 'home grown' coffee, you will have to roast them. There are many 'home type' roasters available on the market, which do an excellent job of evenly roasting your beans. Whether you are willing to go to the expense of purchasing one of these is up to you. It is possible to roast your own beans in the oven. This method will tend to smoke up the house a bit, and the smell of the burned off chaff will tend to linger in the house for quite some time. The amount and size of beans, as well as your altitude will make a difference in the roasting process, so this is a 'live and learn process. The beans should be placed in some form of perforated container, such as a steel strainer or vegetable steamer. Place them in a pre-heated, 250 degree F. oven for about seven minutes. Then increase the oven temperature to 450 degrees. In about ten minutes the beans should begin to crackle. (This timing will depend on the temperature, heat capacity of the oven, and the beans; so keep an eye on them.) When the beans start crackling, mix them up, to promote an even roast. Check their color every two minutes until they have achieved a color slightly lighter than the end color which you desire. (As the beans cool, they will continue roasting). When they have completely cooled, store them in an air tight container in the refrigerator. ..... or grind em, brew em and enjoy the freshest Coffee you'll ever taste! Now that's a great cup of Coffee!